When speed is important to your grinding, the Norton 3X wheel is a wheel worth considering. Unlike other fast cutting wheels, the 3X wheel actually runs cool so you run less risk of overheating your tool. Our medium 60 grit is a good way to grind your initial bevel. 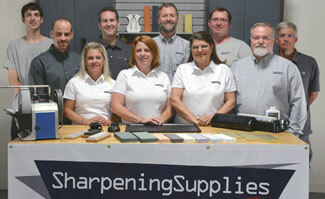 After grinding, a few strokes on a bench stone and your tools are ready for use. This wheel is in a softer I-grade suitable for high carbon steel. Softer wheels run much cooler than harder wheels. The 8" wheel has a 1" arbor hole with bushings for 7/8", 3/4" and 5/8" arbors. The 6" wheels have a 1" arbor hole with bushings for 7/8", 3/4", 5/8" and 1/2" arbors. Q#. 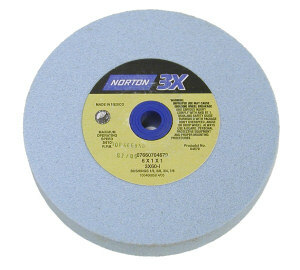 Do you recommend these wheels for sharpening woodworking tools? A#. Yes, this wheel is ideal for grinding high carbon tools such as chisels and plane irons. Q#. Do you recommend these wheels for turning tools? A#. No, we recommend the harder Norton K grade wheel for turning tools. The I grade is ideal for high carbon tools.